As you can probably tell by my books Be a Changemaker and Emmanuel’s Dream, I love writing about heroes and changemakers. It should be no surprise, then, that I love reading about them, too. My favorite kinds of stories are those about ordinary people who acted with extraordinary strength, conviction, and courage, and the book I just finished reading is full of people doing just that. 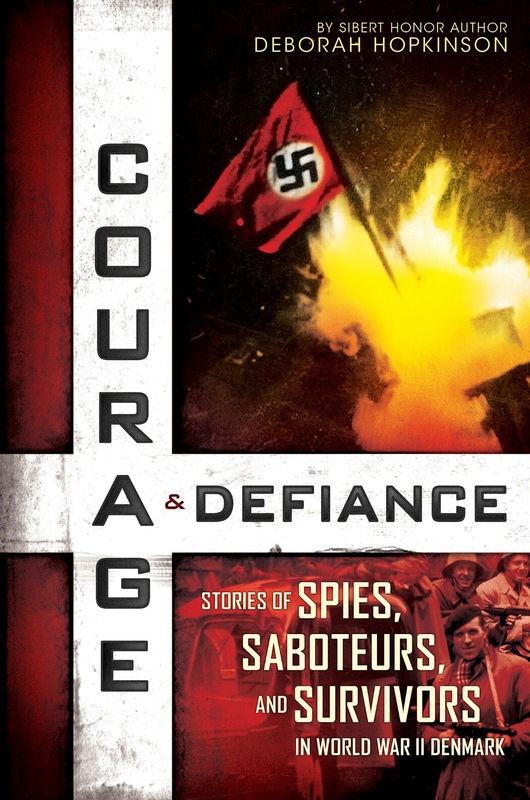 In Courage & Defiance: Stories of Spies, Saboteurs and Survivors in World War II Denmark by Deborah Hopkinson (Scholastic Press, August 2015), the author has clearly done a great deal of careful research to bring us narrative nonfiction about the WWII resistance movement in Denmark from the perspective of some of those who took part in it. It’s a gripping tale of adventure and suspense, and one that has rarely been told. Deborah has been interviewed on this blog before, and I’m super excited to welcome her back once again as part of the Courage and Defiance blog tour. I hope you enjoy the interview! LAT: I know I thoroughly enjoyed this book, Deborah. What kind of young reader do you think Courage & Defiance will appeal to? What other books might be read-alikes? DH: I visit schools all over the country and love to ask students what they’re reading. While fantasy and science fiction are always popular, I’m usually surprised by the number of students – girls and boys – who tell me they like to read about history and like nonfiction. There are definitely kids who read everything they can get their hands on topics such as the Titanic and World War II, but I think readers who enjoyed Number the Stars by Lois Lowry or The Diary of Anne Frank will also enjoy Courage & Defiance. LAT: This is a story that many of us probably haven’t heard before. Why do you think that might be? DH: I think perhaps that here in the U.S., we’re most naturally interested in stories that take place after America entered World War II on December 7, 1941. (As it happens, my next nonfiction book about submarines in the Pacific war begins with the attack on Pearl Harbor and will be out in 2016 for the 75th anniversary.) While I did find a number of adult nonfiction books about the experience of Danes during the German occupation, which began on April 9, 1940, almost all were scholarly titles or of interest primarily to historians (including a 600-page book about the SOE in Denmark). I feel fortunate that I was able to find as much as I did in English, but I am sure there is much more available in Danish. We were able to access the photo archives of the Museum of Danish Resistance. LAT: During the research phase of Courage & Defiance, what discoveries did you come across that made you feel like you’d struck gold? Was there anything in the research that came as a surprise? DH: At author visits, I tell students that my favorite part of writing is the research. And since I knew little when I began several years ago, I felt like I was discovering something new and incredible at every corner. Probably the most significant discovery I made was finding a memoir in English entitled A Letter to My Descendents by Niels Skov. Niels, whom I later had the privilege to meet, came to the U.S. after the war, where he received a Ph.D. and became a college professor. His personal account was so incredibly lively and vibrant – which matched his personality, even at age ninety-four. To my surprise, he had been deported to a German labor camp at the same time as another activist whose story I tell, but they did not meet. It made me realize just how many incredible stories there are in history, and how easily they are lost. LAT: This one may be tricky, but if you can fathom a guess… What do you think it was about the Danes that made them able to resist the Germans and support their Jewish countrymen so effectively? DH: Well, I am not sure I am qualified to say, but what comes across in all the first-person accounts I found was that ordinary people shared an unwavering sense of human decency, a love of country, and a commitment to doing the right thing – even at great cost. It seems to me that as the war went on, the confidence and belief that people had in democratic values helped to give them the courage to take risks. LAT: In the book, you asked Niels what his advice to young people today would be. Now that you’ve done all this research and written such a fantastic book, what is YOUR advice to young people today? DH: While young people in America now may not be faced with life-and-death decisions as Danish citizens were in the 1940s, we all grapple with difficult personal choices. So perhaps I’d simply give the same advice I’ve often told my own two children: make good choices and do good work in the world. And, of course, I have to add: keep reading! LAT: That’s great advice, Deborah. Thanks so much for visiting today! 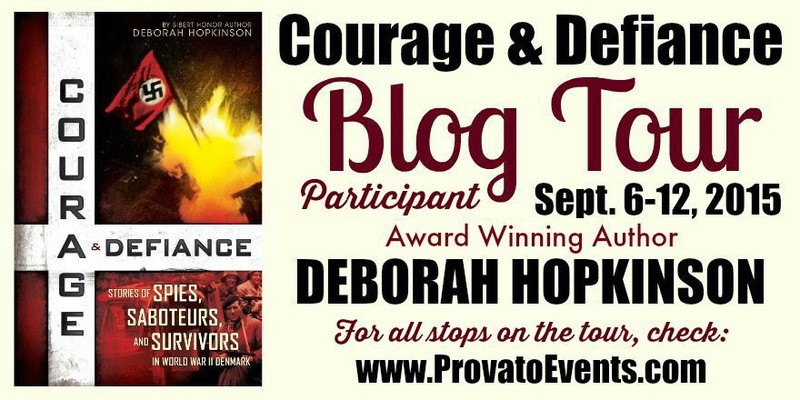 For other stops on the Courage and Defiance blog tour please check deborahhopkinson.com. ← Previous Previous post: Texas Book Festival 2015 authors announced!